The guest of honour and fellow golfer was war veteran Shlomo Ivgy who served in the Golani Infantry Brigade. On October 16 1974 while taking part in a routine stretcher run, a stray bullet from a fellow soldier’s rifle penetrated his spinal cord leaving him a wheelchair bound paraplegic at just 18 years old. He received rehabilitation at Tel Aviv’s Beit Halochem serving on Israel’s National Basketball Team as well as for the Beit Halochem Golf team. 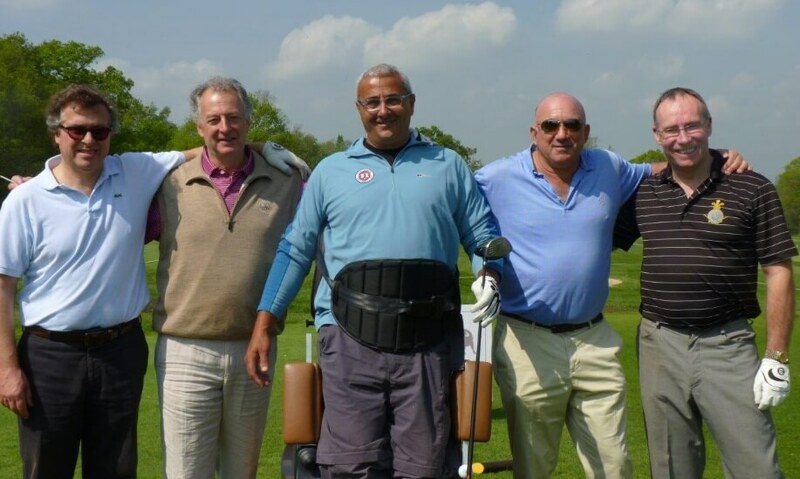 Since the first Para golfer was bought by the charity three years ago, it has enabled him to play golf regularly at Caesarea’s Golf Course. The second event was at Norrice Lea Synagogue where 275 people attended a Friday Night dinner in aid of both Beit Halochem and JTag. JTag educates young people in the community to give them the tools to deal with anti-Semitism and anti-Zionism in everyday life. The Guest Speaker was Colonel Richard Kemp who has spent most of his life fighting terrorism and insurgency, commanding British troops on the front line in Afghanistan, Iraq, the Balkans and Northern Ireland. He became a household name when he addressed the UN debate on the Gaza inquiry report defending Israel against Hamas. He is a huge supporter of Beit Halochem having visited the center in Tel Aviv and was profoundly moved by the experience. He gave a rousing speech about fighting anti-semitism, the bias in the media against Israel and the vital work being carried out at the Beit Holochem centres. He ended the speech by saying how honoured he was to be in the presence of two heroes, Shlomo Ivgy and First Lieutenant Ohad Roisblatt. He received a standing ovation. It was then the turn of First Lieutenant Ohad Roisblatt to tell the packed room his story. “My life changed forever during Operation Protective Edge in the summer of 2014. Since then I have suffered from PTSD (Post Traumatic Stress Disorder). The final event was held at a Cinema Screening at JW3 entitled ‘The Journey Back To Life,’ directed by Maya Aidan. The film told the story of 20 young war veterans who had their own demons to conquer after being injured in Gaza and Lebanon. A psychologist, medical team and film crew accompanied them. ‘Tiyul Shichrur’ was created by Beit Halochem to take the soldiers on a journey of discovery and acceptance to India where despite their physical and mental trauma; they managed to climb the Himalayas. The film was both life affirming and an emotional roller coaster as the audience heard each soldier’s story as the camera followed them on each difficult step.